GTChannel brings highlights and interviews of Tanner Foust at Yas Marina Circuit in Abu Dhabi. Here is Part 2 of GTChannel’s behind the scenes coverage of Daijiro Yoshihara in Abu Dhabi for the Formula Drift invitational event at Yas Marina Circuit. 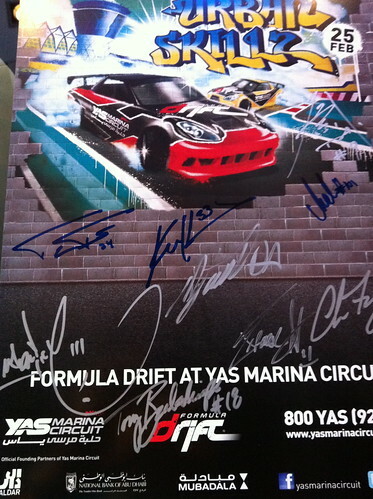 GTChannel followed Daijiro Yoshihara to Abu Dhabi for the Formula Drift invitational event at Yas Marina Circuit. They went behind the scenes to capture a life in the day of professional drift driver Daijiro Yoshihara. Dai and crew arrive in Dubai and take a bus to Yas Marina in Abu Dhabi. They are in awe of the beautiful Yas Marina circuit and the adjacent Ferrari World that has the fastest roller coaster in the world. It’s not all fun and games as Dai shakes down the GTChannel/GTI 350Z for the main event on Friday night. GT Channel Taro Koki post event pictures from Formula Drift Abu Dhabi. Jim Liaw, president of Formula Drift said, “I think we completely exceeded their expectations.” That was an understatement. They had to open up additional seats. The crowd went nuts. It was more like a grand slam homerun. Click to read more from GT Channel Taro Blog. Friday beginning at 4 AM (PST) / 7 AM (EST) the event will be available to view via the Formula Drift Driftstream on Justin.tv.